The genuine Roman carbonara sauce has only four ingredients: eggs, pecorino, pepper and guanciale, or cured pork cheek. I read this, coincidentally, on the very day we head to Vino e Cucina, so I take it as a sign when I see on the menu a spaghetti carbonara listing these exact ingredients. 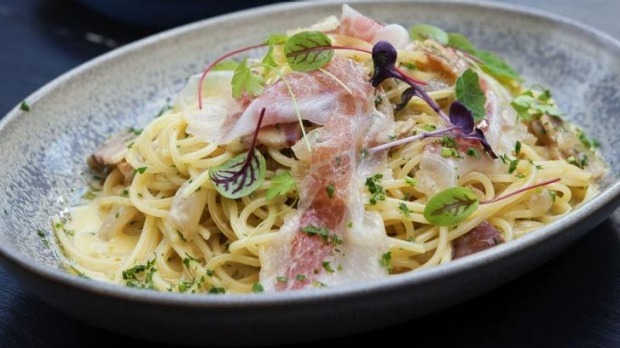 Carbonara is among the guiltiest of pasta pleasures; yet how can I order anything else? When it comes, there are delicate purple leaves scattered on top, and shavings of translucent prosciutto fat. I wish it was steamy-hot, but the guanciale is chewy and salty, and the egg and cheese coat the pasta to creamy, decadent effect. Sounding almost as much of a heart-stopper is the salt-baked gnocchi with taleggio, gorgonzola, radicchio and hazelnut, but my favourite date is too fond of his arteries for that. 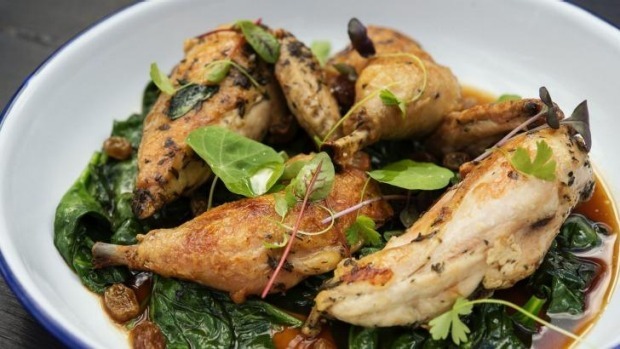 He orders the spatchcock with charred leek, spinach verjus and sultanas. It's well-cooked and tasty in the hearty manner of a good bistro meal. 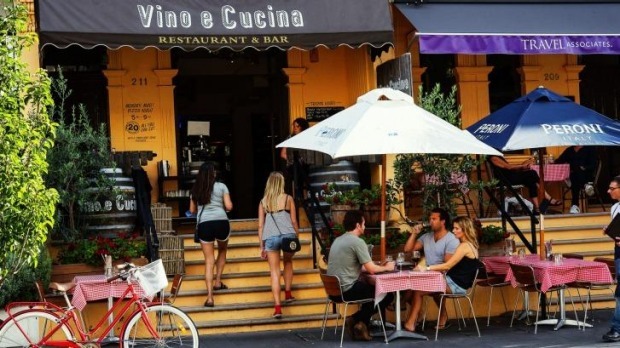 Vino e Cucina is in a terrace house in one of Sydney's most charming urban pockets, Five Ways at Paddington. With its rows of terraces and chi-chi shops with pretty awnings, it has a European feel. At Vino e Cucina there is the feel, more specifically, of Italy. "Buona sera!" rings out as diners enter. The young wait staff come from all corners of Italy – Venice, Rome, Milan – injecting the place with a dolce vita-like energy. "Senora," they say, "some parmesan on your pasta?" as if I don't already have enough cheese. Thank heaven for the menu's delicious-sounding vegetables: broccolini with almonds, chilli and brown butter, for instance, and polenta chips with truffle crema. The grilled corn on the cob with brown butter, sage and grana padano unfortunately falls flat, lacking juiciness and crunch, but the roasted brussels sprouts with smoked almond cream and pomegranate lifts a vegetable of lowly reputation to new and interesting heights. Vino e Cucina feels as though it has been here for years, a restaurant rusted onto its neighbourhood, humming with the talk and laughter of well-heeled locals eating out with family and friends. I'm surprised to discover it is less than two years old. This terrace previously housed celebrity chef Manu Feildel's L'Etoile. The one-hatted French restaurant closed in early 2014, blamed on a lack of bums on seats. Vino e Cucina, further down the price scale and more casual, appears to have no such problem. For a start, there are plenty of places to sit: inside amid the busy buzz and clutter of a traditional trattoria provinciale; on the pavement out front beside tubs of red geraniums at alfresco tables with red-chequered tablecloths; or past the salumi bar with its great hanging hunks of cured meat, in the back terrazzo, where herbs grow in old Italian tomato cans. The owners, chef Michael Bengtsson​ and his wife, Julie Walker-Bengtsson, have plenty of experience in the business, with two other Five Ways eateries, Eat Thai and Tuk Tuk bar. Vino e Cucina, which simply means wine and food, keeps it real, with its traditional menu and $20 all-you-can-eat "Mad Pizza Night" on Mondays. The extensive wine list does take it up a notch, with sommelier notes on wines sourced across the length and breadth of the boot – Piemonte, Campania, Toscano, Veneto. It's heady shot of Italy in a beautiful part of Sydney. Spaghetti carbonara, spatchcock; vanilla bean panna cotta. Charming, in that indefatigably Italian way.